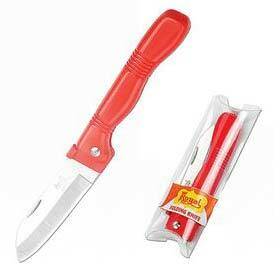 We are a well-reckoned Manufacturer, Supplier, and Exporter of Folding Knife. Our organisation is based in Rajkot, Gujarat, India. We manufacture them by using the premium quality materials and sophisticated techniques. Our skilled professionals develop it with a high level of precision. Our clients highly acknowledge its compact size, perfect finish, and optimum functionality. We have enough capacity to deliver it in bulk quantities, within the given time frame.